At the Castro Theater, on an unusually warm November night in San Francisco I was treated to a rare, cinematic masterpiece. Particularly unique to this screening was the fact that a full orchestra and a complete choir provided the accompaniment to the silent film. But even more unique was the film itself – a film that I had never known about, but whose story is just as epic as the events of the film’s own loss and re-discovery after years of having been forgotten. 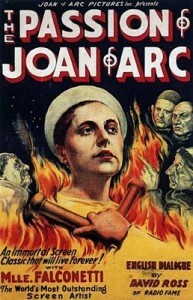 The Passion of Joan of Arc is consistently given the laurels as one of the greatest movies of all time. 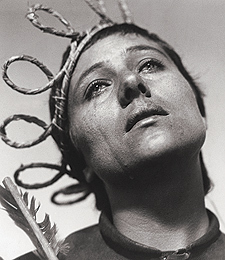 Maria Falconetti’s performance as the 19-year-old Saint, Joan of Arc, has been called the 26th greatest performance in cinema. Sight & Sound’s top ten films poll listed Passion three times (in 1952, 1972, and 1992). But Passion itself is not the remarkable story, despite its revolutionary cinematography and film editing techniques. No, the real story is that of Director Theodore Dreyer, who spent $9 million in 1928 dollars on the Passion of Joan of Arc only to see its destruction by fire a year later. Dreyer died in 1968 believing that his uncut, 86-minute opus in its original format was lost forever. History, however, has strange ways of creeping back into notoriety. When Dreyer passed in 1968, there were only a few rudimentary cuts of the film remaining (whatever wasn’t consumed by fire was censored by religious leaders for its harsh portrayal of Joan’s inquisitors who – let’s not forget – were men of ‘religious esteem’). Dreyer painstakingly tried to piece together fragments in a 1933 release that was 61 minutes long (the original was 86). The film circulated for some time in its less then perfect format until the second original was destroyed once again, annoyingly enough by fire once again. Still, in pure, poetic justice to the film’s namesake and Joan herself (who was given sainthood by the Catholic Church just seven years before the film’s release) an uncut, original release re-emerged in 1981. It appeared in the most unlikely of places: Deep in the bowels of a closet within the maze of passageways of an abandoned psychiatric hospital in Oslo, Norway. An unknown doctor had ordered the film – perhaps intending to show it to his troubled patients as an example of Christian virtue (or maybe even to show his mentally ill patients that divinity is sometimes perceived wrongly as “insanity”). What mattered was that history had rediscovered something it never should have lost — and all because someone forgot to throw away something in their closet. 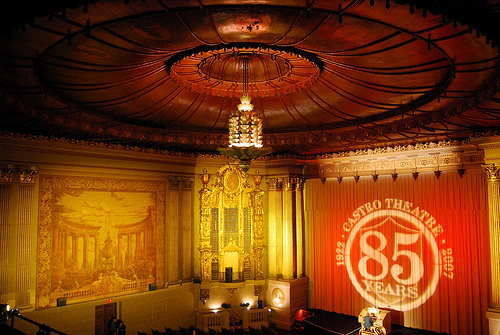 The warm November night I sat admiring the Castro Theater’s Spanish Colonial embellishments and the deco sconces, I imagined the original screening of the film in the very place I was sitting. The Wurlitzer Pipe Organ started the show with verve. The curtains separated. And the lights dimmed. Maria Falconetti’s face appeared, in dramatic close-up. Her tears were palpable, and hundreds of strings heralded the beginning of the oratorio created specifically, and inspired by, the film. Richard Einhorn’s “Voices of Light” could not have been a better match for the dramatic images of Joan of Arc’s final days alive. As it turned out, Passion would be Falconetti’s final performance as a film actress. After a stint as a stage actor, she escaped from France to Argentina at the height of World War II and lived her final days in peace (no doubt from Dreyer’s authoriatarian style of directing). But the re-discovery of The Passion of Joan of Arc will always be considered one of the great blessings of modern cinema. Chances of its survival were slim – the Library of Congress estimates that only 10% of films made before 1928 exist today. But in its 1,300 individual shots, its three-dimensional multi-million dollar set, and the painful passion exhibited on the face of Maria Falconetti we see a new purpose in the preservation of history, even for something as ‘kitsch’ as a reel of old film. This entry was posted on Wednesday, November 19th, 2008 at 11:51 pm	and is filed under Built Environment, Geography in the Media, Geotagged, History, Industrial, Military, Must See Geography, Politics & Borders, Uncategorized. You can follow any responses to this entry through the RSS 2.0 feed. You can skip to the end and leave a response. Pinging is currently not allowed. I saw the film on I think it was TCM one night and I was so taken by it, I couldn’t pull myself from it. It blow me away so many films like this have been forgotten. I eventually brought it on DVD. I envy the opportunity you had to view it in a theater with a full piece orchestra. That is the way it should be viewed. By the way, I love your website. I hope you continue to explore places that have been forgotten, especially the military bases. Your awesome!